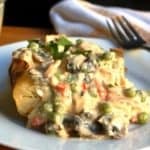 I made this easy slow cooker chicken ala king to serve on top of Easy Crock Pot Baked Potatoes recently. 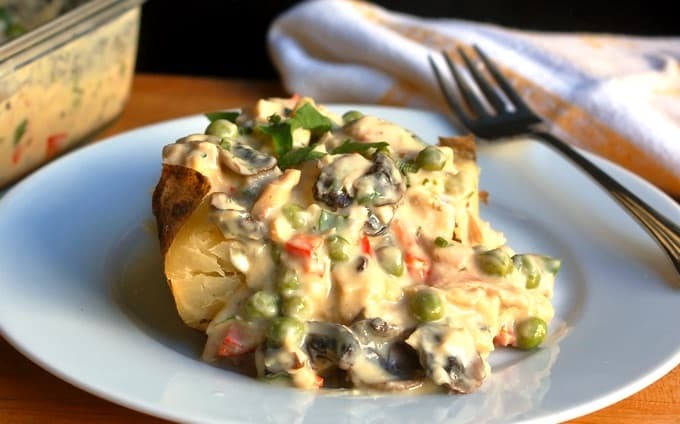 It’s a combination of a couple of different recipes that came together really quickly thanks to a can of creamy roasted garlic Progresso Recipe Starters in the pantry. We’ve both been a little under the weather with cold symptoms, so a dose of this easy crock pot chicken a la king seemed like a perfect creamy comforting antidote. Not to mention great way to use up some leftover cooked rotisserie chicken. I guess I was right, because Rod exclaimed it, “Perfect for tonight,” which I took as a huge compliment. What Can I use Instead of the Progresso Recipe Starters in this Recipe? There are lots of things you could use instead. The easiest is probably condensed cream soup. I’d use 1 can of cream of condensed mushroom or cream of chicken soup stirred together with 1 can of milk. Hope this helps. I served our easy slow cooker chicken a la king over baked potatoes with Caesar salad on the side. According to my calculations, each serving has about 199 calories, *5 Weight Watchers PointsPlus, *3 WW Freestyle SmartPoints. If you’ve made this crock pot chicken ala king, please give the recipe a star rating below and leave a comment letting me know how you liked it. 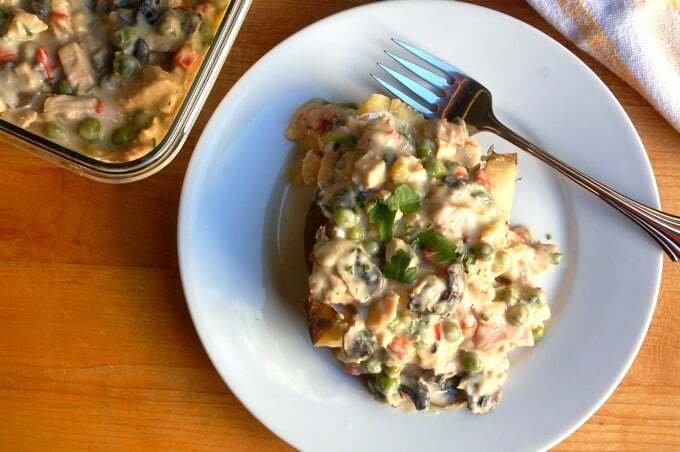 Creamy and comforting, this easy slow cooker chicken ala king is a family favorite. Serve over rice, biscuits or potatoes, if desired. Ideal slow cooker size: 2- to 3-Quart. Whisk together the can of creamy roasted garlic sauce and flour until well blended. Pour into the slow cooker (I used my 2-quart). Add the chicken. In a skillet, coated with nonstick cooking spray, saute the mushrooms, red bell pepper and celery until softened, 3 to 5 minutes, and add to the crock pot. Cover and cook on LOW until heated, about 2 to 3 hours. Add the 1 cup of defrosted peas 20 minutes before serving. Stir in sherry and parsley, if using, right before serving. There are lots of things you could use instead. The easiest is probably condensed cream soup. I’d use 2 cans of cream of mushroom or cream of chicken and skip the flour since the canned soup is thicker than the creamy garlic recipe starter was. Hope this helps. I don’t really care for pre packed or canned soups in a recipe.